PENSACOLA, FL – Majors Home Improvement, a leading Milton, FL-based home improvement company specializing in sunrooms and vinyl replacement windows and doors, has been ranked 147th in the top Replacement Contractors by Remodeling magazine. 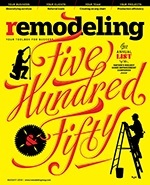 The 2013 winners are featured in the August 2013 issue of Remodeling, a national trade publication read by more than 80,000 professional remodeling contractors. Each year since 1986, Remodeling magazine inducts the owners of 550 remodeling companies that have set exceptionally high standards for professionalism and integrity through exemplary business practices, craftsmanship, and impact in their community or the industry at large. Chosen remodelers run successful, often growing, companies of various sizes that have taken the lead in raising industry standards.